Don’t miss seeing Sarah Stegner, George Bumbaris and Carrie Nahabedian at this year’s Chicago Gourmet. Prairie Grass Café / Prairie Fire partners chefs George Bumbaris and Sara Stegner, with friend chef Carrie Nahabedian, will take center stage at Chicago Gourmet, Saturday between 12:30 and 3 p.m. as they grill right there in front of a live audience. They will be featuring their popular homemade Italian Sausage. Known for serving local, sustainable foods, the meat is local from Maple Creek Farm. The dish will be accompanied by a medley of pepper, tomatoes, cucumber and onions tossed with a spicy vinaigrette. The vegetables will all be from Green City Market. Stegner is a founding member of Green City Market. Carrie Nahabedian, also a longtime member of the Green City Market board, will be sharing the grill and Stegner and Bumbaris, all promoting local (on the heals of Green City Market’s “Locavore” competition. Featuring some of Chicago's top chefs, Chicago Gourmet (September 23-25 in Millennium Park, Chicago), an exclusive foodie fest of which Chicago can be proud, is more representative of Chicago’s exciting dining scene than its more pedestrian counterpart the Taste of Chicago. But with exclusivity, comes a price. Tickets for Chicago Gourmet are steep. A two-day pass is $250 per person, and tack on an additional $175 if you want to attend a Grand Cru event. If you want eat your way through Chicago’s best restaurants, try an array of fabulous wines, mingle with the city’s who’s who, and pick up some tips at educational seminars, this is the place to do it. The event features tons of demonstrations and gourmet food tastings from more than 50 chefs. Wine and spirits samples abound, provided by more than 300 wineries and 65 spirits producers. Gourmet Chicago also features wine seminars from master sommeliers. The most anticipated, and limited to only 200 people per day, is the aforementioned Grand Cru event which features exclusive tastings of more than 50 premium (i.e., expensive) wines from around the world. Guest master sommeliers include Serafin Alvarado, Fernando Beteta, Frederick Dame, and Alpana Singh. American Express Cardmembers can use their American Express card to purchase tickets and save 15%. Inquire how at info@chicagogourmet.org. Here’s the link to purchase tickets. In spite of her award-winning history, Chef Sarah Stegner is modest in the way she approaches her life as a chef, she’s an easy person to embrace, and so likeable you just want to cheer her on. As she embarks on her new venture with co-chef, partner and friend George Bumbaris, she exudes her pride and excitement with a grin and a gleam in her eyes. Stegner is thrilled at the great sense of freedom she is experiencing in putting together the restaurant. “We were ready to do this… this is the right thing to do at this point in our careers. We are happy with the location; we are in the right spot with the right people.” The right people include hotel and restaurant industry veteran and husband Rohit Nambiar, who will be managing front of the house operations and Stegner’s mother, Elizabeth Stegner. Elizabeth will be in the kitchen teamed with daughter Sarah, baking her “transcendent” homemade pies that make the dessert menu something truly special. Having the right team is only part of a winning equation that ensures this venture to be a safe bet. “It’s all about the quality of the product—its freshness, its flavor and the care by which it has been handled,” she says. It isn’t surprising that Stegner puts the ingredients first. She will talk about her [exceptional] technique when prompted, but she truly believes that it is her attention to quality and local, fresh ingredients that has provided the springboard for her success. Stegner continues to incorporate fresh, seasonal produce from small, regional family farms into her menus at Prairie Grass Cafe. From the beginning, Stegner was creative. She spent a year studying classical guitar at Northwestern University, and then followed her heart and enrolled at the Dumas Pere Cooking School in Glencoe, which at the time was one of the few professional culinary schools in the Chicago area. She graduated with a chef's certificate one year later and was hired as an apprentice at The Ritz-Carlton Hotel Chicago, under the guiding hands of executive chef Fernand Gutierrez. Later she worked with the hotel’s executive chef George Bumbaris, and they established a friendship and a professional camaraderie that has stayed strong for twenty years. They both remained at the Ritz-Carlton throughout the years and developed stellar careers. Over the years, Stegner received numerous accolades that built her reputation and that of the Dining Room at the Ritz-Carlton. She was competitive early. In 1990 she represented the United States in the prestigious Prix Culinaire Internationnal Pierre Taittinger, a multinational cooking competition. She was the only woman to compete; she placed fifth. The recognition began in earnest in 1994 when she received the Rising Star Chef of the Year award from the James Beard Foundation. In 1995 she received the Robert Mondavi Culinary Award Of Excellence. In 1996, 1997 and 1998 she was nominated for Best Chef: Midwest by the James Beard Foundation, winning the prestigious award in 1998. Meanwhile the Dining Room at the Ritz-Carlton earned constant praise throughout the industry. In 2000, Wine Spectator called the Dining Room “One of the Top 20 Restaurants In America.” Also in 2000, Condé Nast Traveler magazine named the restaurant the “Second Best Hotel Dining Room in the World.” In 2002 and 2003, Food & Wine magazine named the Dining Room “One Of The Top 50 Hotel Restaurants In America.” Local critics were equally enthusiastic. The Dining Room received a rare 4-star rating from Chicago Magazine, which also named the Dining Room the “Best Hotel Restaurant in Chicago in 2003.” The Chicago Tribune also gave the restaurant four stars. While she certainly enjoyed the recognition, Stegner continued to stay focused on her main culinary mission: cooking with the best seasonal ingredients she could find. She accelerated her search for locally produced ingredients. 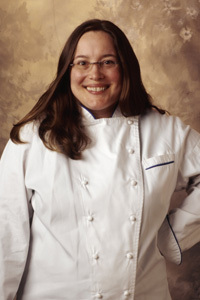 In 1999 she joined Chicago food writer Abby Mandel and a small group of Chicago’s top chefs to form Chicago’s Green City Market, a weekly venue for Midwest sustainable farmers who produce freshly picked fruits and vegetables, meats, artisan cheeses and many other top-quality ingredients. Green City Market has become an important Chicago institution, and Stegner continues to serve on its board of directors. “It’s time to have fun! My only hope is that I continue to produce something that I am proud of,” she says, with characteristic modesty. Her excited grin and that gleam in her eye tell us that Prairie Grass Cafe is going to be her personal pride and joy for a long time to come. “It started out as a hobby,” George Bumbaris recalls. “I just wanted to learn how to really cook. But once I got into the kitchen, I got hooked.” In 1983 Bumbaris began a 21-year journey at the Ritz Carlton Hotel in Chicago that crowned him executive chef in 1991. Now he and partner Sarah Stegner have joined forces to open Prairie Grass Cafe in Northbrook, Illinois. Bumbaris went to the Ritz-Carlton in 1983, right after completing his studies at culinary school Dumas Pere in Glencoe, Illinois. “I went to the Ritz-Carlton with the idea that I would be there for a couple of years and I would then open a restaurant,” he chuckles now, doing the math and adds, “It ended up being a couple times ten.” Before his culinary education George studied architecture, opened a body shop to work on cars, and dabbled in construction. He felt cooking was a job that was also fun. “I never found myself looking at my watch when I was cooking and wondering when my next break was,” he says. His philosophy about managing a top-notch kitchen is all about building a strong base and training the staff from the bottom up. “If you continue to train from the bottom up, then people are going to work with your technique, the way you want them to work.” Bumbaris’ stellar career at the Ritz-Carlton reflects this philosophy. He started out as a line cook at the Ritz-Carlton. In 1989 he was promoted to executive sous chef, then to executive chef in 1991. “I remember starting out and thinking I could do this, I could become the head chef one day.” All of these accomplishments now hold special meaning for Bumbaris because cooking is something he has seen through to great accomplishment, unlike his first career choices that always fell by the wayside. Bumbaris excelled at cooking and his skills showed time and time again in reviews for the hotel in publications such as the Chicago Tribune, Chicago Magazine, Food and Wine, and Condé Nast Traveler. He won awards for his culinary excellence. He won first place for the United States in the 26th Prix Culinaire International Pierre Taittinger in 1992 representing America at the finals in Paris. Bumbaris also took first place in The Bocuse D'or American Culinary Gold Cup in 1990. 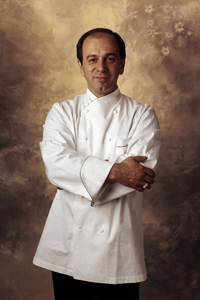 In January 1991, he represented the United States in the International Bocuse D'or competition that was held in Lyon, France during the Salon des Metiers de Bouche, a leading French gastronomic show. He competed with chefs from 22 countries from around the world and captured a top prize for his original "Sole Of The Four Seasons." For Bumbaris, beginning this new chapter at Prairie Grass Cafe with long-time friend and colleague Sarah Stegner made perfect sense. They had talked about it for a long time, the timing was right, and “we’ve worked together long enough where there are no surprises— and a lot of trust,” declares Bumbaris. He also adds that they both now have reached a level of culinary maturity that’s important for what they want to accomplish. “We don’t carry the ego with us. We just want a good restaurant with good food.” In addition to the joy of working side by side with Stegner, Bumbaris has enjoyed developing a menu that is fun and accessible. The duo still thrives on using seasonal produce, locally grown when possible. Bumbaris has understandably high hopes for this next chapter. “My vision is a restaurant packed with smiling faces, enjoying their experience with us and enjoying our food,” he adds. Bumbaris always teaches his staff to cook they way one would cook for oneself. With a rule of thumb like that, we can all look forward some great food at Prairie Grass Cafe. John Legnard, Blue Moon Brewing Co.